Readers may know of the UNESCO list of World Heritage sites; that is, structures, monuments, almost any physical thing, natural or man-made, from entire sections of cities to single buildings to the Great Barrier Reef, anything that is part of our universal cultural and natural heritage deemed worthy of protecting. UNESCO has another list, much more recent, but just as interesting—the list of Intangible Cultural Heritage (ICH), that is, the practices and skills that communities recognize as part of their cultural heritage. These are the things that people do, the music they play or sing, their art and theater, crafts, etc., that which helps to make them what they are. In Italy there have thus far been three such items on the ICH list, the Cantu a tenore (Pastoral songs) of Sardinia, Sicilian Puppet Theater, and the traditional violin craftsmanship in Cremona. There is now a new addition: “large shoulder-borne processional structures” one (of four in Italy) takes place in Nola, quite near Naples; it is the tradition of the gigli (pronounced jilyee), which I have translated as “spire floats.” The word, itself, literally, means "lilies." Note that this is a joint listing shared among four cities in the same sense as World Heritage listings may be distributed among different sites, as in the case of The Longobards in Italy, Places of Power. Also note that some Italian immigrant communities elsewhere in the world use this type of structure, usually on a much smaller scale, for some religious processions, such as the one for the San Gennaro festival in Little Italy in New York. The procession of these mobile spire floats celebrates the return from captivity of the patron saint of the city of Nola, St. Paolino, a fifth-century bishop. He had agreed to be taken hostage by invading Visigoths in exchange for the release of prisoners taken as slaves by the invaders. When he returned to Nola in the year 431, the townspeople met him with flowers and candles mounted on simple wooden structures that over the centuries have evolved into the elaborately constructed gigli one sees today. The spires, themselves, are 25 meters (75 feet) high and are mounted on a square wooden base, three meters (9 feet) on a side. They typically weigh 2500 kg (5500 pounds), about like an elephant. The rim of the base has rails or poles attached, used to hoist and carry the structure. Local artisans decorate the floats in papier mâché and stucco using religious and historical themes. The structures may be considered “votive spires” in the same sense as large fixed religious spires such as those in Naples. There are generally 120 persons employed around the perimeter of the base to carry each giglio (singular of gigli). They are called cullatori, probably from the slow rocking movement as the structure is carried along; such movement recalls the rocking motion of a cradle, and the Italian verb for rocking a cradle is cullare. The procession takes place each year on the Sunday following June 22. 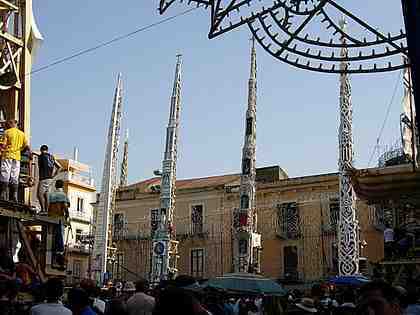 There are eight spire floats in the procession plus one small structure in the form of a boat that represents the return of San Paolino. Each float is named for a traditional trade guild, Ortolano (grocer), Salumiere (delicatessen keeper), Bettoliere (pub keeper), Panettiere (baker), Beccaio (butcher), Calzolaio (shoemaker), Fabbro (smith) and Sarto (tailor). The procession moves around the historic nucleus of the town of Nola. It takes the entire day, is accompanied by various types of music, and involves a traditional blessing at the Nola cathedral.